The BSA Scorpion SE is the next step in the BSA range, redefining the hunting carbine and moving the sporting rifle to a whole new level which shooters could only previously dream of. 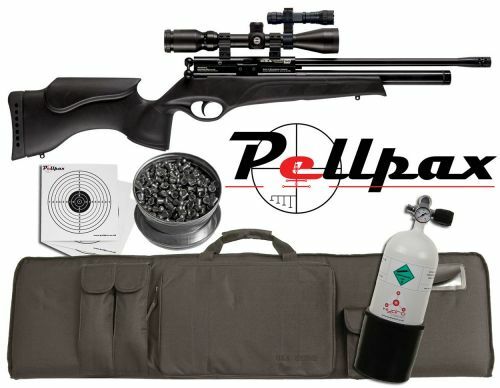 Its combination of full power specification and comfortable handling means that it performs as well in the field as it does on the target range. The match level barrel means the accuracy is second to none and helps to deliver consistent groups again and again. We are now offering this superb rifle as part of this Full Combo kit which includes the BSA Scorpion SE Tactical with a 10 shot magazine, a Hawke Vantage IR+ 3-12x50 AO IR scope, a LED torch, a BSA Tactical Gun bag, and a Top Quality 5 Ltr 'Stumpy' charging bottle to finish it off. We are also including a pack of our match targets, and a tin of pellets free of charge to get you going. The complete kit normally has an RRP of £1025 so this kit represents a great saving compared to when purchased separately.